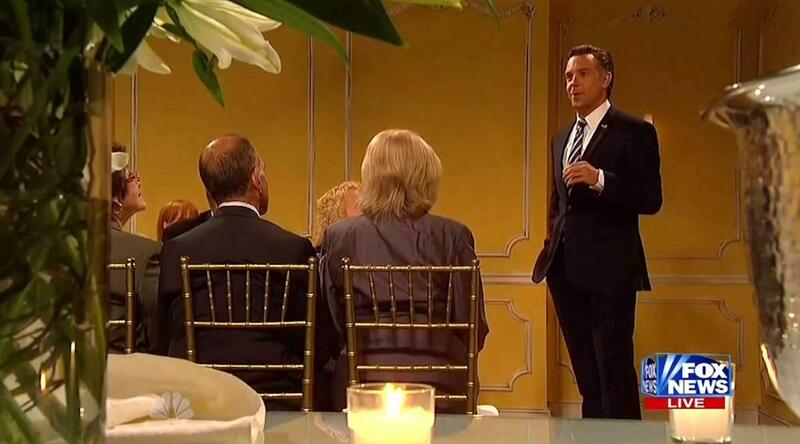 Saturday Night Live trashed Mitt Romney and gave President Obama a pass on their September 20 election special. SNL, which is known for its unabashed liberalism, took to the air Thursday night to smear Romney as a racist politician. In total, SNL spent over 6 minutes smearing Governor Romney but just 13 seconds gently poking fun at the president indirectly. The show opened with a skit depicting the hosts of FNC's Fox and Friends and proceeded to show four fake scenes of Romney. So you have this 47 percent that don't pay taxes, and these people are never going to vote for me. And when I talk about these people who don't pay taxes, I don't mean senior citizens. All right? And I don't mean members of our armed services. And I don't mean southern whites. Okay? What I mean is -- and real quick -- no one is recording this, correct? No? Okay. It’s very important that no one records this. Okay. Good. Because I'm about to say who these people are, and I would prefer to not have that on tape. Sorry, sir, is that a camera on the table pointing right at me? Okay. Great. Alright, now, when I say "these people," I mean black people. SUDEIKIS: Trust the staff with your valuables. KATE MCKINNON (AS ANN ROMNEY) That’s true of any hotel. SUDEIKIS: But it’s especially true in California, aka North Mexico. And if you don't mind, could you wire my winnings to the Cayman Islands? We do that for tax purposes to pay less. Oh, poor people hate having jobs. Oh poor people hate having jobs. The only thing the poor hate more than condoms is waking up and going to a job. At the end of the segment, SNL worked in a birther joke, making one wonder if MSNBC's Chris Matthews is an honorary joke writer now. While MSNBC seriously pushes the meme that the GOP is chock full of racist birthers who loathe lower-income earners, SNL is trying to sell the same message through comedy. TARAN KILLAM (AS STEVE DOOCY) Well, it's been a few days but the press is still pummeling Mitt Romney over comments he made at a private GOP fund-raiser last spring. VANESSA BAYER (AS GRETCHEN CARLSON) Okay, comments that were secretly videotaped without his permission. BOBBY MOYNIHAN (AS BRIAN KILMIADE) It’s like the woman's volleyball coach at my high school used to always say, you can't tape people without their permission, Brian. KILLAM: And I for one don't even see what's wrong with the comments he made. BAYER: Okay, there was nothing wrong with them. Let's take a look. JASON SUDEIKIS (AS MITT ROMNEY) So you have this 47 percent that don't pay taxes, and these people are never going to vote for me. And when I talk about these people who don't pay taxes, I don't mean senior citizens. All right? And I don't mean members of our armed services. And I don't mean southern whites. Okay? What I mean is -- and real quick -- no one is recording this, correct? No? Okay. It’s very important that no one records this. Okay. Good. Because I'm about to say who these people are, and I would prefer to not have that on tape. Sorry, sir, is that a camera on the table pointing right at me? Okay. Great. Alright, now, when I say "these people," I mean black people. KILLAM: I mean, what's the big deal? BAYER: He's just telling the truth. Okay? Black people aren't going to vote for Mitt Romney. MOYNIHAN: If I was black, I would think Mitt Romney was king of the honkies. BAYER: Call me crazy, but I like seeing an honest moment from a politician. KILLAM: Yeah, well, you know, you're in luck because that's not the only video that surfaced this week. Here's a cell phone video of Mitt Romney talking to voters at a McDonald's. SUDEIKIS: You know, people think I'm fancy, but I like nothing more than to end the day with one of these fine hamburger sandwiches from the good people at the McDonalds. Oh, boy, that's disgusting. How do you people eat this garbage? Oh, my goodness. I'd complain to the chef, but let me guess, no habla Englais. I need to get this taste out of my mouth. Do you mind? Oh, my gosh, that was soda pop. Uh-oh, here comes the sugar blindness. Oh, no, oh, no. KILLAM: See, I watch that and I think, okay, he's not perfect, but he's human. BAYER: Name one human who is perfect, you know? BAYER: Okay, Santa Claus isn't a real person. MOYNIHAN: Okay, come on. Let's not have this argument again. KILLAM: Alright, I think tapes like these are only going to help Mitt Romney. Here's another one. TIM ROBINSON (AS BEN BAILEY): You are in the Cash Cab. It’s a TV game show that takes place right here in my taxicab. All you have to do is answer questions. The first question is worth $25. SUDEIKIS: That's okay. We're not going to answer questions for a quarter. SUDEIKIS: Right, which is a quarter of a hundred dollars. Is there any other type of quarter? I don't understand. KILLAM: That was great. That was great. BAYER: What is wrong with that? KILLAM: There's nothing wrong with that. MOYNIHAN: My dream is to be on Cash Cab. I've spent entire weekends just taking a different taxi block to block at a time hoping to get my chance. KILLAM: You know these videos let me know, hey, Mitt's just like me. I mean, do you sing in the shower? KILLAM: Yeah, and what about you Brian? MOYNIHAN: Oh no, if I sing in the shower, i always miss a bunch of spots. KILLAM: Well Mitt sings just like me as we can see from this secretly taped shower. SUDEIKIS: Oh, poor people hate having jobs. Oh poor people hate having jobs. The only thing the poor hate more than condoms is waking up and going to a job. KILLAM: That one's tougher to spin. BAYER: Yep, we shouldn’t have shown that one. KILLAM: Why was there a camera in the shower? BAYER: Yeah, that was really weird. MOYNIHAN: Is waking up and going to a job. That's a catchy song. BAYER: We'll take a quick break. But first our fact checkers have one or two corrections from the first two hours of the show. KILLAM: Alright, now when we return, a home movie has surfaced of a 4-year-old Barack Obama asking for something called pisgetti? BAYER: Does he not know how to pronounce it? MOYNIHAN: Maybe that's how they say it in Swahili. KILLAM, BAYER, MOYNIHAN: Live from New York it's Saturday Night!